- Dog - Westie Charm is approximately 1/2" X 1/2"
This sterling silver West Highland Terrier charm is a special piece of handcrafted jewelry. 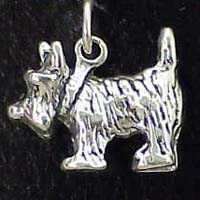 Each Westie charm would be a gleaming addition to any West Highland Terrier jewelry collection. It makes a nice West Highland Terrier gift item. Approximate size on the West Highland Terrier charm is 5/8 inches. Small Westie Pin in Crystal/Jet with a 23K Gold finish. Medium Westie Pin in Crystal/Jet with a 23K Gold finish. Large Westie Pin in Crystal/Jet with a 23K Gold finish. 3D West Highland Terrier Sterling Silver Charm with multi-color Enamel is available from jewelbasket.com for only $128.24. Buy now and save. Jewelbasket offers the best value on , jewelry and gifts.